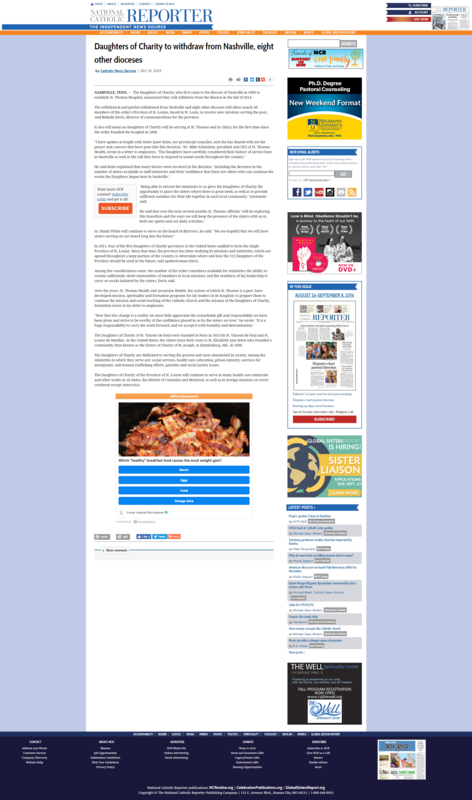 Sisters in Crisis - I - No More Daughters of Charity at Nashville Hospital - Marian T. Horvat, Ph.D. I say tales, because they are fairy tales for anyone who observes reality. To counter this misinformation from the progressivist camp, today a series titled Sisters in Crisis begins on TIA website. It looks at different Orders of our old teaching and nursing sisters in the United States to see the dismal, disastrous remains of this once thriving, strong Catholic presence in so many cities in our country. Today, the Daughters of Charity in Nashville, Tennessee, are featured. They were nursing sisters who engraved their Catholic presence on this primarily Protestant city. Unfortunately, the story is a familiar one. 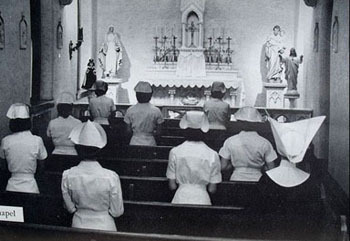 A Catholic hospital once under the administration of religious sisters and staffed chiefly by them is gradually secularized. The chief reason for this is the lack of younger sisters coming up to replace the older ones; of course, the primary cause for this dearth of sisters is the “reform” of women religious instituted by Vatican II. In 1898 Nashville Bishop, Thomas Sebastian Byrne, invited the Daughters of Charity of St. Vincent de Paul to his Diocese to establish a hospital, certain it would do much good for the community. The Bishop bought a mansion home in a residential West End neighborhood on Church Street and converted it into a hospital. 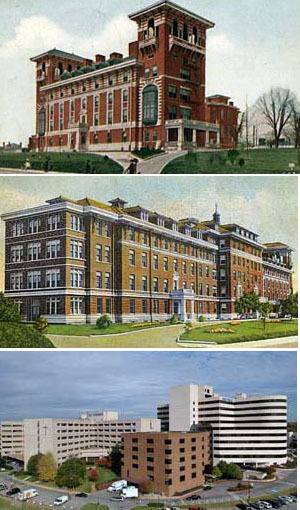 On April 11, 1898 St. Thomas Sanatorium was born. Under the capable direction of Sister Scholastica, the Mother Superior, the hospital grew. In 1902, a new building of red bricks with arched roof towers on either end was constructed to meet growing needs. A nursing school directed by the Daughters became a part of the program, and the St. Thomas facility rapidly became one of the leading hospitals of the South. The competence, energy and expertise of the nursing Daughters of Charity made them much in demand. But it was something more that won them the love and devotion of the people they served. In their distinctive grey habit with the white cornette, these sisters embodied lives of sacrifice. They received no personal salaries, they renounced the social amenities and feminine vanities of the world - all with the aim of serving Christ and seeing Him in the suffering sick of humanity. Such a noble mission reflected in the demeanor and person of each sister, who became a symbol of the model selfless nurse. After Vatican II, however, things started to change. No more triangular white cornettes were seen in the hospital halls. The Sisters now were in modified habits or secular dress. Soon, the vocations started to diminish and the School of Nursing closed. In 1975 the old St. Thomas Hospital was torn down to make way for a parking lot and the current thoroughly modern institution opened on Harding Road. Then, following the general trend in hospital administration, St. Thomas Hospital became a part of St. Thomas Health, a conglomerate of hospitals of different denominations and a network of affiliated clinics, services and rehabilitation facilities. The Sisters who remained were professionals, dressed for a time in modified habits and finally just in lay clothing. The traditional vows of the Daughters of Charity were redefined for the 21st century: for example, the vow of obedience was replaced by an ambiguous vow of dependence, and the vow of poverty practically disappeared when the sisters began to have budgets and spending money to use as they pleased. The vow of obedience was considered obsolete, a remnant of a hierarchical world of rulers and underlings. Let us look, for example, at Sister Naomi, the last Daughter of Charity at St. Thomas. Like most other sisters of the Order, she was not even carrying out a nursing role. A paid employee with a full benefits package, she was part of the Hospital’s “pastoral care” team from 2011 until her retirement this year. 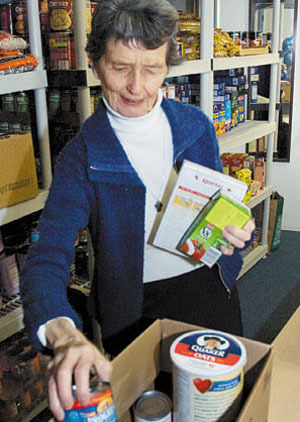 Her past “career” included directing the North Nashville Outreach Program of Catholic Charities. Careers, salaries and retirement were not part of the vocabulary of the pre-conciliar Daughters of Charity. A spokesman for St. Thomas Health, Dr. Mike Schatzlein, pretends that the Daughters are leaving because they have other urgent “ministries” that better meet their mission “to serve the poorest of the poor.” The real reason, however, is the clear decrease in the number of sisters and the growing number of elderly sisters who can no longer give care, but need it for themselves. The mission of the Daughters of Charity is to seek Christ in the poor, thus their motto “The Charity of Jesus Christ crucified urges us.” The post-conciliar Church falsely claims that the emphasis in Religious Orders has shifted to a more effective serving the poor, as if the Catholic Church prior to Vatican II were somehow deficient in this sphere. The truth, however, is that before the changes in women religious orders that ‘liberated’ them from a supposedly harsh past, the work of the nursing Daughters of Charity flourished, their hospitals prospered and grew, and their numbers multiplied to keep up with the labor. Then, there was no lack of idealistic girls eager to embrace a life of sacrifice without financial remuneration for the love of Christ.